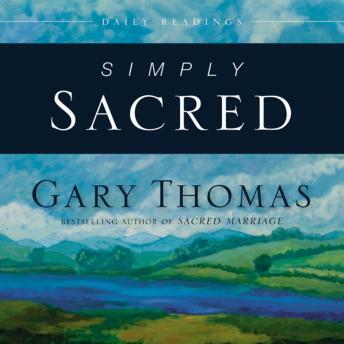 Gary Thomas is a popular writer of Christian spirituality with a well-developed platform.Building on his bestselling books Sacred Pathways and Sacred Marriage; his newest book, Pure Pleasure; and his Gold Medallion-winning Authentic Faith, Thomas takes readers to new levels of inspiration and insight in Simply Sacred-a devotional made up of selections from his best writings about spirituality and spiritual formation. According to Thomas, "Those who have advanced in the Christian life have learned to develop an almost mystical memory that keeps them attuned to the fact that God is always with them ... always watching, always caring, always hearing. "Abounding with spiritual insights and practical truth, this book provides readers with the freedom to approach life in Christ with new wonder and joy each and every day.